Featured / Recipes / 15.11.2015. 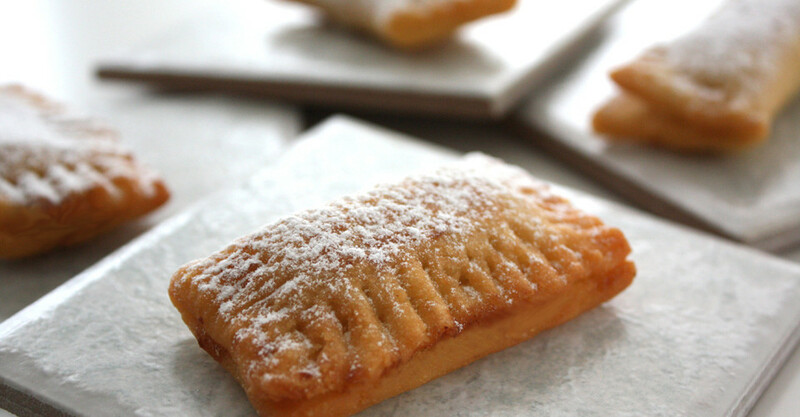 Rafioli the fried shortcrust pastry with almond filling origins from the peninsula Pelješac. The rich almond filling aromatized with Maraschino and orange coated in pastry shall fill the kitchen with its fragrance. And the taste .. mmmmm, you must try it. Mix flour, salt, sugar, eggs, melted lard and milk and knead until you make a firm dough. Wrap in some plastic foil and leave it in the fridge for about 30 minutes. For the filling beat all ingredients together into a smooth mixture. Roll out the dough between two plastic foils to be thin and cut with a knife squares (6×6 cm/2×2 in). Spread filling on one half of the square and fold pastry over the filling and press the edges together with a floured fork. Deep-fry the Rafioli and place it onto some kitchen towel and leave them to dry. Sprinkle with powder sugar and serve warm with Maraschino or Prošek. Before frying the Rafioli prick the dough with the fork once again and with this side down deep-fry the Rafioli. For larger Rafioli do not fold the dough squares over the filling but rather cover it with another dough square and press the edges together with a floured fork. This pastry makes about 60 Rafiolis.